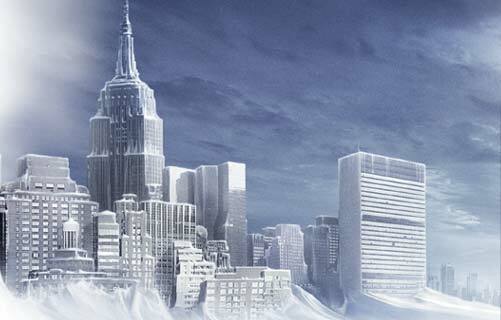 Is the Ice Age Expected to Come Soon? The seasons are not the same as it used to be before. Drastic climatic changes are taking place and the winters have been unusually and immensely covered with snow in certain parts of America and other Asian countries. The ice bergs of the Arctic were doomed due to the climatic changes and it has been recently observed that it is reviving. This is the case of the winters since 2008, but the trend may change in the following winters. But yet, we have reasons to believe that the, so called 'Ice Age' is round the corner. One of the reasons is the changing pattern of global ocean current circulation. Let us first understand the normal global ocean current which begins at the cold water in the polar region. The water moves down beneath into the seas and this induces a water current due to the low temperature, in the ocean bottom. When this water reaches the waters of the tropical region, it consequently warms up and rises and is moved towards the north by the winds. This is an efficient system which ensures efficient heat distribution. The recent Greenland ice sheet melting has altered this global ocean conveyor belt. This has released huge quantity of fresh melted ice to flow into the water bodies. Being fresh water from the ice, it is less salty and does not sink efficiently thus disrupting the water currents and the heat dispersion leading to immense cold conditions. This reason is verywell-known and there are reports that there is a small reduce in the flow of the Gulf Stream from the Gulf of Mexico to the Atlantic promoting warm air circulation. Another prominent reason that has made all climate and astronomy researchers worried about the Ice Age occurrence, is the role of sun spots. Sun spots are cool areas on the sun. These areas are very active and responsible for sending out huge heat dispersion through flares and mass releases. This heat is pumped out to the earth and other planets of the solar system. The factor that has worried international scientists is the observation that the sun spots are recently less active. The sun has been under such inactive condition, about 500 years back and that period was known as 'little ice age'. This will create an overall worldwide cooling of 1 degree Fahrenheit leading to an agriculture with death of crops, livestock and resulting famine across the globe. The lakes would freeze all around the world to worsen the situation further. These directly reflect that we are in for an Ice Age sooner or later. But there are people who are pessimistic for a change. The scenario is well depicted in the movie 'The Day After Tomorrow'. It was actually the movie that bought the attention of the people to this upcoming global disaster that is basically caused due to global warming. The changes can happen quickly, maybe not as rapidly as depicted in the movie. But yet we can expect it to happen in the near future. Research is still being conducted to monitor the progress of this situation and what can be done to bring back the Gulf Stream to its normal state.